Looking for help with endometriosis? What does endometriosis pain feel like? Endometriosis is hard work, but you can claw back some quality of life with the right support. Talk to me, I’m here for you. Last Saturday I attended the yearly information day about endometriosis hosted by Endometriosis UK. 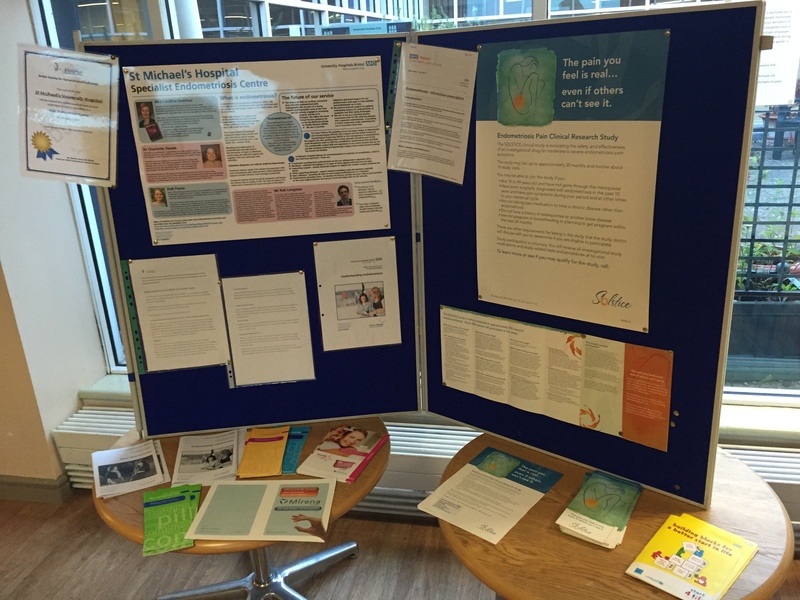 The information day was an opportunity to learn more about the latest developments in endometriosis trearment and find out the latest advice from endometriosis consultants and patients. As ever it was a neat opportunity to meet and talk to lots of other women with endometriosis. This event couldn’t have happened without Endometriosis UK, so if you were enable to come to this event, please consider coming along next year or supporting the charity through donation or membership. I’ve written up an account of the day as completely as I can, just as I did for the 2013 information day and the 2012 information day. Naturally it doesn’t compare to actually being there. I’ve had to paraphrase some of what the speakers said (I couldn’t always hear everything), so what is written here does not represent the views of the speakers or Endometriosis UK. I apologise for any inadvertent mistakes. Always discuss any changes to your treatment plans with your doctor and consultant as they know the best treatment for your personal circumstances. With that in mind, here’s what we learnt on the day. Just a quick update to let you know that I’ll be attending this years Endometriosis information day in London. I’ll be doing my best to to write up a summary of the information discussed there as I did in 2012 and 2013. It would be great to see some of you while I am there, so if you have visited my website (and found it helpful) or would like me to write something in particular for you come say hi. These information days are crucial for finding out the latest treatment information about the treatment and care of endometriosis, and for meeting other women with this illness. I’m a member of Endometriosis UK, and this yearly information day is run by them so if you can’t make it this year, I really recommend supporting them through membership, or looking at the other ways you can support this amazing charity. Watch this space for this years information day update, and thanks to Endometriosis UK for hosting such a fantastic support day. 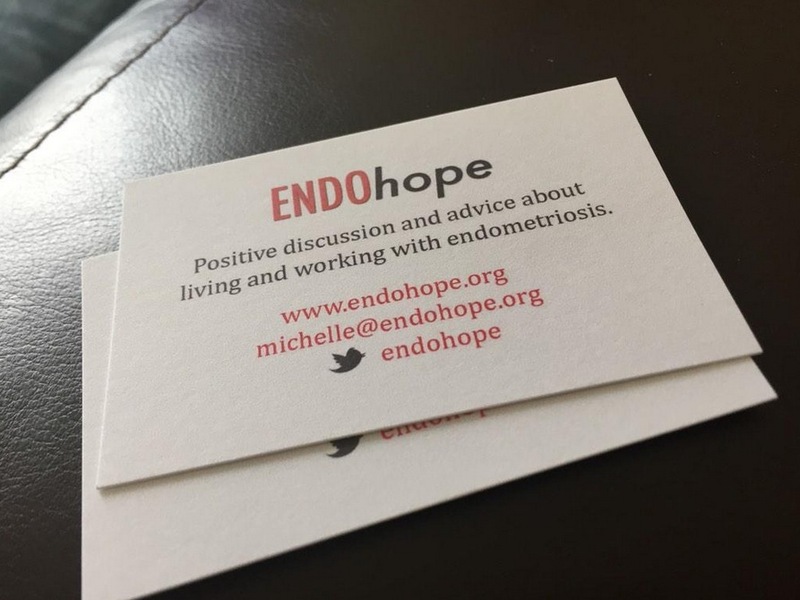 Last week I had the pleasure of attending a Bristol Endometriosis UK support group meeting where the group leaders had arranged a Q&A session with the endometriosis team from St Michael’s Hospital in Bristol. St Michael’s is one of the 30 BSGE accredited endometriosis hospitals, which works specifically on women with endometriosis and support them and their partners with every aspect of the disease using a cross-discipline team. It was a really interesting evening, the group was supportive and informative, and it was great to be in a specialist endometriosis centre with all the support that location offers. I thought you’d all benefit from reading the information shared at this event. I’ve made the notes where I can, but I wasn’t able to hear some of what was discussed. So with that in mind, this update doesn’t totally represent the views of the St Michael team or the audience. I have had to paraphrase some of what they said. Some of the questions asked, weren’t actually questions, so I’ve taken a little poetic licence to make them questions so they make sense to you. Like anything you read online everything is best discussed with your doctor and your consultant as they can see your medical history and your case file, and what may or may not help you. With all of that in mind, here’s what we heard. What would you improve about your endometriosis treatment? In a weeks time I have a meeting with a number of people from the NHS to talk about what living with endometriosis is like, and what I’d potentially like to see improved about endometriosis care in my county. Nothing may come of it, but it’s the first real chance I will have to influence some change in regards to how endometriosis is treated in my local area, who knows where it could lead to. It got me thinking about how this isn’t just about my perspective, I want to adequately represent what it’s like to live with this disease. I don’t just want to talk about how it’s important issue in my area, but a national and international problem that some people in the medical profession are collectively underestimating. If you could change one thing about how your endometriosis is treated, what would it be? Here are some ideas to get you started. Was the information you received up to and after your diagnosis appropriate? Have you received any long-term support or care? Do you routinely see someone (such as a pain management team or pain clinic) about your pain? Does your medication adequately help the pain? Have you been told about pain management and pacing? Do you feel endometriosis is taken seriously by the people who treat you? Have you ever been offered counselling or sexual therapy? Have you been given any physical information (such as leaflets, booklets, or website links) by the NHS or other health service? Were you discharged from your consultant after your laparoscopies? How long did it take for your endometriosis to be diagnosed? Are you still waiting? Did you know what endometriosis was before you were diagnosed? Was your pain ever played down when you sought help? Please share your story and send this to anyone you feel would want to raise some issues. A heads up for those of you in the UK. I’ve been invited to talk about my experience of living with endometriosis on BBC Radio Gloucestershire on Friday 11th July at around 12:45pm. If all goes to plan I’ll be speaking to Anna King about what endometriosis is, what it’s like to live with, and what advice I’d give to others with the illness, including what care provisions exist for endometriosis patients my local area. Edit: You can hear me speaking about my experience with endometriosis on the BBC Radio Gloucestershire website, skip to about 48:43 . Do you have endometriosis and are you based in the UK? 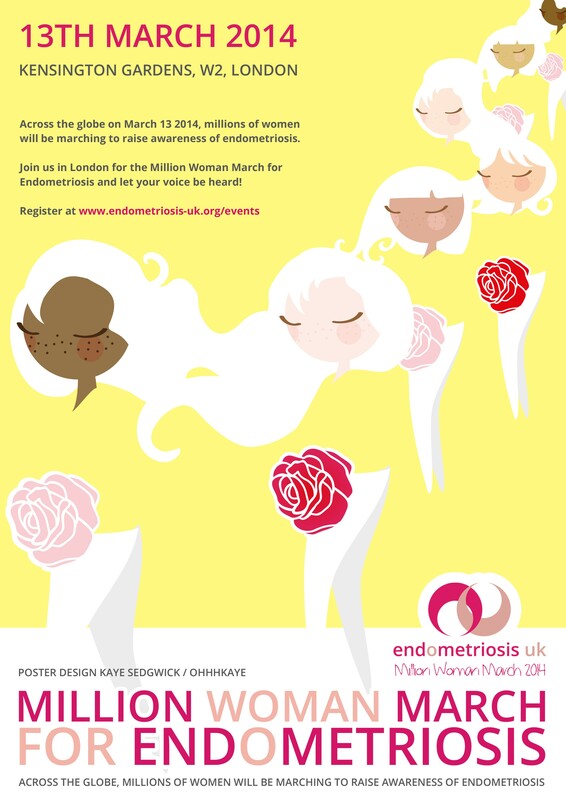 I’m hoping if so that you’ll be attending the Million Woman March for Endometriosis on the 13th March in London. We’ll be doing a peaceful march around Kensington Gardens to help raise awareness of the impact of endometriosis. This will coincide with marches all over the world culminating in a million women marching for endometriosis awareness. There’s a piccie of me on my about page if you want to seek me out on the day too. You can find all the information about the London event here, and register for the event if you want to take part. There’s information on how to take part if you can’t make it. We all have our part to play in this event, hope to see you there. I attended my second Endometriosis UK information day a little while ago in Coventry, and despite arriving late, I did my best to write up a detailed account of the day and an overview of the information discussed at all of the seminars and discussion groups. Endometriosis UK is the leading endometriosis charity in this country (and the host to these information days), and they normally hold one information day a year explaining their work and progress, as well as providing tons of information from consultants, pain specialists, GPs and nurses. I was pleased to see that this year they’re continuing their work to invite nurses and other healthcare professionals to the day to better their understanding of endometriosis and its impact on women. If you’re interested, I also attended the last the same information day last year, and wrote up an account of that day too. Some of the information repeats from one year to another so I won’t spend too much time repeating that and I’ll highlight what I’ve written about previously. I had the pleasure of attending the an endometriosis information day held at UCL in London on 6th October 2012. It was run by Endometriosis UK (the UKs leading endometriosis charity). I know that many of you either live too far away or were unable to attend due to illness, so I consider it my pleasure to provide a summary of the day, and the information provided. Firstly though I highly encourage you to attend the next Endometriosis UK information day if you are able. It was a really enjoyable, informative and positive day. Although it was a long day, all of the seminars were insightful and the Endometriosis UK staff and volunteers were an incredible help – a shining example of how this disease can bring out the best in people. Crucially though this was my first experience of meeting and talking to other endometriosis sufferers (in person at least), and I made a lot of new friends. So the day became as much about chatting to others about the experience of endometriosis as it was attending the seminars. I really can’t do the day justice, but I’ll do my best.